Links are a great way to direct your Facebook followers to content stored outside of Facebook, but the challenge is getting your audience to click-through. You can create a wonderful image, craft the perfect call-to-action, post the link at the time most of your followers are online and still not get many clicks. Why? Most likely because your links aren’t being seen by your followers. Currently there are two ways you can share a link on Facebook. The first is by uploading a picture directly to Facebook, then pasting the link in the caption or description. The second is to paste the link in your status and let Facebook populate the the post with an image and a description from the source you are linking to – known as the link-format. So, which way is best for visibility in the News feed? As of January 2015, Facebook is prioritising posts with links in the link-format, and showing fewer posts with links in the captions or status updates. Why? Facebook found posts with links in the link-format received twice as many clicks compared to links embedded in the description. At Social.iQ we have adopted the link-format and taken it one step further. Like on Facebook, if you go to publish a link on our platform, we will pull the image and description from the source. However, if you don’t like image or description provided, you can change it. Upload or design your own image, create your own link description – the power is in your hands. 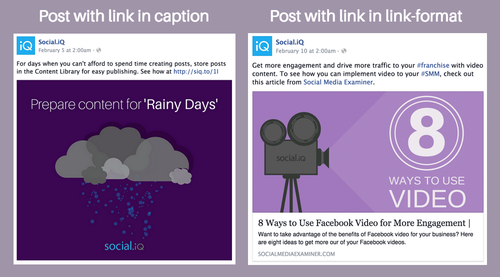 Through Social.iQ’s new link feature, you will can post links that are both eye-catching and functional.